By submitting this form, the Parents of this student angler grant the Brainerd Warrior Fishing Team the right to take photographs of me and my property. I agree that they may use such photographs, with or without my name, for any lawful purpose including publicity, advertising, and Web content. ​By submitting this form, the Parents of this student angler acknowledge that the Brainerd Warrior Fishing Team is not responsible for any injuries that may occur and hereby assume any risks involved with participating in this activity. Registration fee is $75. 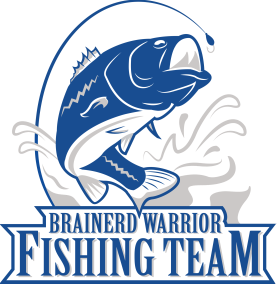 Please make checks payable to: Brainerd Warrior Fishing Team. The registration meeting is on Friday, March 29th at 6pm in the Brainerd High School cafeteria. payment to your school’s main office no later than March 29, 2019.